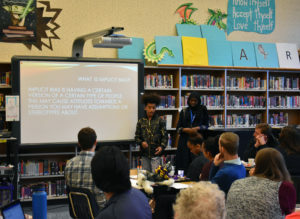 Last week, Trailblazers presented a professional development (PD) workshop on implicit bias for the entire educator staff at Washington Middle School, which was the first PD in the Seattle School District ever led by students. The session was led by Washington Middle School students Sona, an 8th-grader, and Kimilo (a.k.a. Bubbles), a 7th-grader. Sona and Kimilo told their personal stories and led discussions on what implicit bias is, which biases were in the room, why people have implicit bias, negative impacts of implicit bias, and solutions. Kimilo shared his experience in 4th grade, when he had a teacher who has a bias against black students. This teacher sat him and his African-American classmates at the back of the classroom and treated them differently from their classmates, which made him feel alienated. When Sona was in 7th grade, a teacher assumed she was on her phone when she put her head down on her desk because she had a headache. Sona felt that her teacher did not develop a relationship with her because of the teacher’s bias. Sona, Kimilo, and several of the 41 educators in the room revealed their personal biases. Kimilo explained how he has a bias against white male police officers, a sentiment that was shared by a Latino male educator and an Asian female educator. Sona described her bias against white male teachers due to her 3rd-grade teacher making her feel dumb – she told the teacher that she wanted to be in the Advanced Placement program because she felt like she was smart, and the teacher said it’s not just about feeling smart, it is about being smart. The Asian female educator echoed that, clarifying that she experienced teachers making her feel dumb because English was not her first language. A white male educator shared that he has a bias against students who are late to class. Another white male educator said that he looks at black male students and assumes that they play basketball, especially when they are tall. And another white male educator shared that if he sees students of color playing in the hallway, he assumes that criminal activity is happening. The educator added that he once inaccurately believed Sona was stealing another student’s phone, and in the future, he will instead “act dorky” to diffuse the situation. Sona and Kimilo listed the negative impacts of implicit bias, which include teachers maintaining lower academic standards for students of color, students of color experiencing disproportionate suspension and expulsion (a friend of Kimilo’s who was supposed to co-present the morning’s implicit bias PD was unable to attend because he was suspended), students of color not being placed in highly capable programs, and students of color receiving lower grades than their white peers. In order for educators to overcome implicit bias, Sona and Kimilo recommended that educators become aware of their own biases so that they can fix them. Educators can also study implicit bias and teach their colleagues. The students also suggested paying attention to teachers and leaders who try to close the achievement gap, watching for implicit bias in their school, and not buying into a single story about their students – there are always a multitude of factors that influence a student’s behavior. Developing relationships with students is key, especially the students whom educators consider to have problematic behavior, and giving them platforms to tell their story. In the Q&A forum after the presentation, a white male educator asked Sona and Kimilo how staff can get to know students who exhibit what they consider problem behavior. Sona and Kimilo answered, “Talk to them. Talk to their parents to find out what’s up. Give them space, and they’re share when they’re ready. Be genuine, and tell your students that you care.” When asked how school staff can talk to privileged white students about implicit bias, Sona and Kimilo suggested holding a school assembly and forming student advisory groups. 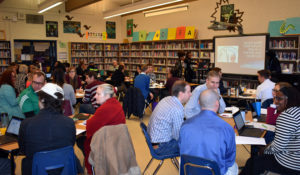 Throughout Sona and Kimilo’s presentation, the 34 white educators and 7 educators of color at Washington Middle School remained highly engaged. They praised Sona and Kimilo’s courage, participated in the partner sharing, offered their own biases to the large group, and asked thoughtful questions. 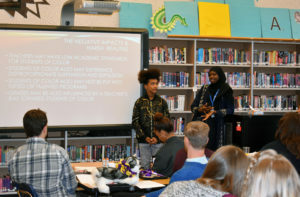 The morning’s implicit bias PD clearly demonstrated that students are wise beyond their years, and are an untapped resource to make our education system more welcoming for all.